I increasingly favor the alternate term “degenerate strategy.” In game theory (which has nothing specifically to do with games and more to do with obscure strategic matrices that bear faint relevance to real-world economics) a dominant strategy is a way of approaching a competition which is universally better than other available approaches. Imagine a game of Rock, Paper, Scissors, Bomb, like the traditional game except that Bomb always wins. The dominant strategy here is to always play Bomb, because then you’ll tie at worst. In the book Rules of Play, Katie Salen and Eric Zimmerman use the term “degenerate strategy” to refer to a dominant strategy which results in the player focusing on one narrow approach to play, making miss out on the full complexity of the game. If one unit type in a strategy game is universally the best choice to use, with no need for another type of unit, that presents a degenerate strategy. The most effective way to play the game is to use that unit at the exclusion of others. And that’s a boring way to play. Is “be cautious” a strategy? Only sort of. To be deliberately superficial: suggesting someone “be cautious” is barely more useful than suggesting they “not die.” The fact that XCOM requires you to be cautious is a simple result of it being a game in which resources (i.e. soldiers) can be permanently lost, errors cannot easily be recovered from, and fortunes can change quickly. The alternative to “be cautious” is to take foolish risks, which is something the game takes pains to teach you to avoid. It’s not quite that simple, of course; there is no “be cautious” button in the game. Caution is an approach that requires adapting to circumstances and evaluating risk. There are simple actions that you can take that are cautious, including using cover and placing soldiers into Overwatch mode so that they will shoot at moving enemies. There are also complex behaviors, such as advancing slowly while providing cover or focusing fire on the most hazardous enemy. The set of cautious strategies is dominant over the set of reckless strategies, which could include tossing grenades near your own soldiers or splitting up your squad. However, there is an array of choice within the set of cautious strategies. Do you risk a support character’s safety in order to tend to an injured character in a dangerous position, or do you stay put and risk the injured character being killed? Do you leave your soldiers in a well-defended position with a low chance of hitting the enemy, or do you move them into a more vulnerable position to better kill an enemy and reduce the amount of incoming fire? The fact that there are multiple competing options within the set of cautious strategies demonstrates that it’s not very useful to consider caution a strategy. Instead, caution is a heuristic function: a property that can be used to evaluate the suitability of strategies. In XCOM, all other factors being equal, a more cautious strategy is a better one. Of course, all other factors are rarely equal. XCOM has a variety of mission types. In the most common and most basic types, the goal of a mission is simply to kill all enemy units. In these missions, it’s fine to prioritize caution over other choices. There’s no real advantage to completing these missions in fewer turns. However, there are also missions where bombs must be defused before they explode, or people must be rescued from killer aliens. In these missions, there is a tension between caution and the mission objectives. Taking too long will result in detonation or civilian deaths. Cautious play must be tempered by efficiency, and is therefore not a degenerate approach. In order to be effectively cautious, you have to understand and account for the totality of the game. Caution is one of the primary things that XCOM explores. Just like Thief: The Dark Project explores stealth and Knytt explores, well, exploration, caution (and its counterpart, risk) is one of the primary themes of the game. One could imagine an alternate XCOM where “brave” risk-taking let you could increase a soldier’s Will and quickly completing a mission provided resources that would compensate for the increased chances of injured or dead units. In such a game, it would be more useful to examine to what degree cautious strategies were dominant. However, the XCOM in our world is designed to encourage caution and punish recklessness. The interesting decisions concern how to be cautious, and when to relax this otherwise stringent requirement in the service of other priorities. 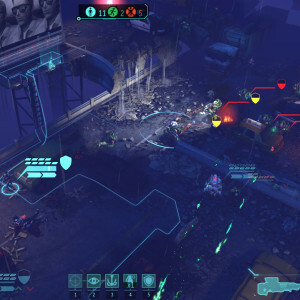 This overwhelming pressure to be cautious, and the despair when caution fails, provides XCOM with its uniquely apocalyptic mood. And that sensation, of struggling against overwhelming odds and always being an inch away from defeat, is very interesting indeed.